Lev Grossman is the author of the recently released The Magician King, sequel to The Magicians, as well as two other novels Warp and Codex. Now the book reviewer / technology writer for Time magazine, he has written for a number of publications and has been visibly promoting fantasy literature in such places as the Wall Street Journal and NPR. We recently caught up with Lev to talk with him about his latest book (reviewed here). SF Signal: Hi Lev…thank you for taking the time to speak with us. First off, what is the story behind the creation of The Magicians, and now, The Magician King? Lev Grossman: When I was 35 I realized that I was still thinking a lot about what it would be like to go to Narnia. To really go — not just in a daydream, or in a children’s book, but what it would actually feel like, physically, psychologically, every other way. The idea was haunting me. I guess it was a way I had of dealing with depression — I’d reached a particularly low moment in my personal and professional life. Writing Quentin’s story was a way of finding an answer. SFS: The works of C.S. Lewis come into play quite a bit in The Magicians and The Magician King, as well as countless mentions of other stories: what other works have influenced your thinking? LG: It’s a long list, both in and out of fantasy. I feel very conscious of my influences. T.H. White is very important for me. What I do with Narnia is really just an echo of what he did with King Arthur, rewriting it, making it ring more physically and psychologically real to modern ears. Bingle, the swordsman in The Magician King, is very much an homage to Fritz Leiber’s Gray Mouser. More recently Susanna Clarke and J.K. Rowling have been huge influences, in very different ways. Then there’s a lot of books from outside of fantasy as well, mostly from the 20th century. Brideshead Revisited. The Sun Also Rises. Mrs. Dalloway. SFS: I’ve talked to a number of friends currently in the ‘just-out-of-college’ phase of their lives, and they readily identify with some of the characters who are seemingly drifting without purpose once they get out of the educational system: do you see The Magicians as holding a larger commentary? LG: I do actually. I definitely didn’t write it to make a point, but in retrospect it certainly reflects the lost feeling I had when I left college. When I graduated I couldn’t see where the story went from there. I drifted for a long time. Years. Longer than I like to think about. SFS: One criticism of The Magicians was its similarities to The Chronicles of Narnia and Harry Potter. In retrospect, would you have changed anything? SFS: Let’s turn to The Magician King. It surprised me when I read it: How do you approach a story like The Magicians and take the story even further? LG: The Magicians was a coming of age story, so in a lot of ways by the end of the book the bigger story was still just beginning. Quentin had finally grown up enough to be a proper hero. He’d come into a sense of his own power. Now it’s time for him to figure out what to do with it. Also, selfishly, there were a lot of parts of Fillory he hadn’t been to yet. I wanted a look at them. I sometimes think C.S. Lewis must have been thinking something like that when he wrote The Voyage of the Dawn Treader. Just get everybody onto a magic boat, and see what happens! Also I was wondering what had happened to Julia. SFS: Did you have some of the story lines in mind when you wrote The Magicians, or did the narrative grow in the telling? LG: I never thought about the idea of writing a sequel to The Magicians at all, not until after the book was published. Which was probably a good thing. I never tried to game anything in The Magicians, setting up little threads to deal with down the line. It’s its own book. When it came time to write The Magician King, I figured that if the underlying logic of the first book was sound, it should be possible to build something from it, and it turned out it was. SFS: An interesting point is the differences between those who attended Brakebills, and those who didn’t. For all the arrogance that the Brakebills alumni might display, it wasn’t them who brought about the end of the world. What, do you think, is the balance between an ordered system, and complete freedom from one? LG: The Brakebills have a very stuffy, hidebound way of doing magic, and it’s limiting. But magic is wild, dangerous stuff. You never realize how useful limitations are until it’s much too late. SFS: The Magicians is a bit about self discovery: Quentin drifts through life until reaching Brakebills, and finding a purpose through magic: what overall themes do you see in The Magician King? LG: I think for a long time, I was paralyzed by some of my hopes and ideals for what my life was going to be like. I had this perfect vision of how my life should go, but it seemed — it was — impossible to realize, so I sat around for a long, long time doing almost nothing at all. Quentin is paralyzed in that way too. He has to learn to accept the imperfection of life, and the richness and the challenges that come with that imperfection. It’s also about power. There’s no Voldemort in The Magicians books, no Sauron, no towering figure of ultimate evil, so it’s not obvious whom you’re supposed to fight, and what you’re supposed to do with all the magic you’ve learned. There are bad things in the books, terrible things, but it’s not always so easy to spot them. They don’t have a big neon sign over them that says, Fight me, I’m evil! So the story becomes about learning what to do with power. SFS: But the real world has had its super villains: the recent killing of Osama Bin Laden brought a number of comparisons to a number of evil characters, don’t get us started on figures such as Stalin or Hitler. Wouldn’t magic bring out some of humanity’s worse elements, and by extension its best? Or is it just a matter of perspective or proximity? LG: Oh, it definitely would. I have no doubt there are magician psychopaths, and magician serial killers. I doubt Brakebills admissions is very good at screening for those. They just don’t interest me that much. I was never wildly compelled by Voldemort as a villain – he’s creepy as hell, but he feels like a psychopath to me, zero empathy. His psychology is really alien. As a writer I’m more drawn to villains who are just slightly mad, like Snape. SFS: You establish in The Magician King that the magical world is essentially a loophole in the existence of the universe, from the gods who set up the place and upon which the world is based on. Does this negate the idea that magic is inherently supernatural, and push this into science fiction territory? LG: Not at all. Or a least, I don’t think so. SFS: Do you see The Magician King as straight up fantasy, given how magic is portrayed in the world you’ve created? What are the divisional lines between science fiction and fantasy? LG: I see The Magician King as straight-up fantasy, period. I love playing with the conventions of fantasy, and breaking rules, and crossing lines, but the line between SF and fantasy, wherever it is, is one I prefer to leave alone. I’m a fantasy writer. I don’t do SF. This is important to me. If you’re not clear on what genre you’re in, everything gets muddled, and it’s hard to know which rules you’re breaking. SFS: You’ve been vocal in your support of fantasy fiction: what does fantasy offer the reader that other genres (even outside of speculative fiction) don’t? LG: It’s not easy to say, is it? Whatever it is, I think we’re coming to need it more and more. There was a time, not that long ago, when a lot of our popular imaginative capital was heavily invested in science fiction. Technology, the future, Star Wars, Star Trek, The Matrix, The X-Files. That seems to be changing. Maybe there’s a sense that technology isn’t necessarily the answer to a lot of our problems. Fantasy offers readers a less radically alienated world – a world where desires and feelings that normally are trapped inside your mind are made real in the form of magic. The line between outside and inside is fuzzier in fantasy. Maybe that’s something people are looking for. 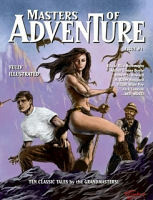 SFS: There’s a lot of good fantasy novels out in the market right now: George R.R. Martin’s Game of Thrones series has never been more popular, and there’s a great wealth of new authors out there. Do you see any difference between the fantasy novels of now and the fantasy novels of a couple of decades ago? LG: Oh, huge differences. The last ten years has been another golden age for fantasy, I really believe that. I think of it as similar to what happened to superhero comics after Watchmen. Moore annihilated a lot of the sacred conventions of the superhero comic, and as a result he was able to write the greatest superhero comic ever. He opened up a lot of new possibilities. I feel like the same thing his happening in fantasy. Maybe there’s not one book that had the same seismic effect that Watchmen did, but taken together books like American Gods and Magic for Beginners and Perdido Street Station and Jonathan Strange & Mr. Norrell amount to a Watchmen-level event. SFS: You’re the book reviewer for Time magazine, and a novelist at the same time. How has reviewing books impacted your writing of them? LG: The main advantage of being a reviewer is that you read a lot. A lot of books get sent to you, and you have an amazing vantage point from which to observe what’s going on in contemporary fiction — not only genre stuff, the whole spectrum. Then if you see somebody doing something really cool, you can immediately go and steal it. SFS: I bought my copy of The Magicians at a Borders in Pennsylvania: they supported the book heavily. Do you have any thoughts on the end of that particular store, as someone who has a broad view on the publishing industry? LG: I felt really sad about it personally. Borders worked very, very hard to make The Magicians a success, and for no reason other than that some of the executives in Michigan really liked it. The broader view of the death of Borders seems to be more about economics than it is about books, and I’m not an economist. I really don’t think it says very much about American book culture. The most convincing theories of Borders’ demise that I’ve read are more about Borders’ managing of its real estate. SFS: The inevitable question, I suppose, is whether there will be a follow-up nobel to The Magician King. Do you have another Magician‘s book in mind? What’s next for you? LG: I absolutely have one in mind. I haven’t written a word of it yet. But I will. I’ve not had the pleasure of reading either of the books,but after listening to Lev’s interview with the local public radio station, and this interview, this is a lacunae in my reading I need to correct! There was a time, not that long ago, when a lot of our popular imaginative capital was heavily invested in science fiction. Technology, the future, Star Wars, Star Trek, The Matrix, The X-Files. That seems to be changing. The last ten years has been another golden age for fantasy, I really believe that. I think of it as similar to what happened to superhero comics after Watchmen. The irony being that the last 10 years covers the history of SF Signal. Maybe you guys should change the name to Fantasy Signal? Anyway this is not a criticism of SF Signal only an observation of the shift of popular interest and the timing of it in relation to SF signal….i confess my interest has gone to fantasy of late. I just wanted to thank Lev Grossman. I have enjoyed both of the Magicians’ books immensely and I am dying for more. I wish there was something a person like me could say to urge Mr. Grossman to continue, to reassure him that his stories and characters are being received with all the fascination and love in the world by some. If I was Lev I might explore what happened to Alice and her brother – what its like to be a niffin – are they together?, will the fox have to pay for what he did – exploring ‘justice’, and maybe just about a million thousand other story parts that were so resonant, original and interesting….